bl.uk > Online Gallery Home	> Online exhibitions	> Asia, Pacific and Africa Collections	> Delhi Gate, Agra Fort. 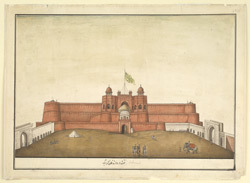 Drawing of the Delhi Gate, Agra Fort in Agra, Uttar Pradesh. The Red Fort at Agra was built during the reign of the Mughal emperor Akbar (r. 1556-1605) at the heart of his territories. As the Mughal capital for a time, he built many fine structures in Agra and made it the grandest city of the empire, much praised by contemporary chroniclers and foreign travellers. The fort is semi-circular, with its base along the west bank of the Yamuna river. It was built over a period of 14 years (1565-79) and is a sound military structure whilst being architecturally beautiful. Its massive walls and ramparts are faced with red sandstone and huge circular bastions project from the walls. Inscribed on the front of this drawing in Persian characters: 'Naqshah i darwazah i qil'ah i Akbarabad' (Picture of the gateway of the fort of Agra).